Marianne Williamson's bestselling A Return to Love ended with a prayer in which she asked God to help us "find our way home, from the pain to peace, from fear to love, from hell to Heaven." Now, in this stunning new collection of thoughts, prayers, and rites of passage, Marianne Williamson returns to prayer. 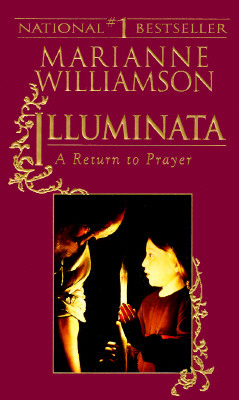 Prayer is practical, Williamson tells us. "To look to God is to look to the realm of consciousness that can deliver us from the pain of living." Illuminata brings prayer into our daily lives, with prayers on topics from releasing anger to finding forgiveness, from finding great love to achieving intimacy. There are prayers for couples, for parents, and for children; prayers to mend broken relationships and prayers to overcome obsessive and compulsive love. There are prayers to heal the soul, prayers to heal the body, and prayers for work and creativity. Williamson also gives us prayers for the healing of America, including two prayers that have had powerful effects on audiences at her lectures: a prayer of amends on behalf of European Americans to African-Americans and one to Native Americans. How, Williamson asks, can we expect anyone to forgive when we have made no formal apology? Another section includes rites of passage, ceremonies of light for the signal events in our lives: blessing of the newborn, coming of age, marriage, and death. There is also a ceremony of the elder, for moving into midlife, and a ceremony of divorce, in which a gentle transition is provided for both the couple and their children. "Read my prayers or someone else's," Williamson says. "By all means, create your own." Illuminata is a way to bring prayer into practical use, creating a sweeter, more abundant life for yourself and the people you care for. "No conventional therapy," she says, "can release us from a deep and abiding psychic pain. Through prayer we find what we cannot find elsewhere: a peace that is not of this world." Marianne Williamson is an internationally acclaimed spiritual author and lecturer. Marianne has been a popular guest on television programs such as Oprah, Larry King Live, Good Morning America, Charlie Rose & Bill Maher. Six of her eleven published books have been New York Times Bestsellers. Four of these have been #1, including Illuminata, A Woman's Worth, and the mega best seller A Return to Love, considered a must-read of The New Spirituality.